Whether tortilla chips fall into the healthy category depends on a few factors. The amount you eat matters because the calories only fit in your daily diet if you limit the portion. To keep your snack low in sodium, you'll need to avoid the flavored-varieties. 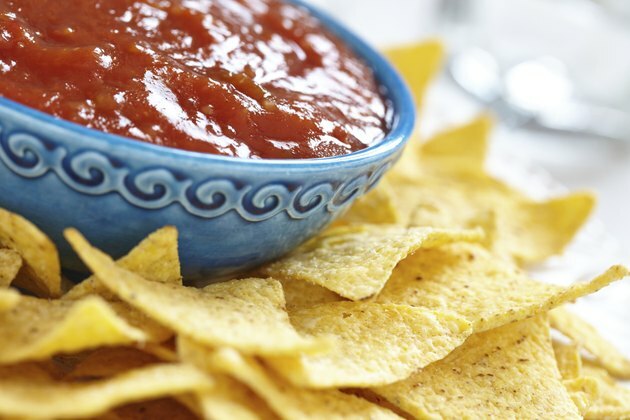 Tortilla chips have fewer nutrients than some other snacks, but if you pair them with tomato salsa, you boost the nutrients without adding a lot of calories. The University of Rochester Medical School recommends keeping snacks in the range of 100 to 200 calories to ensure they satisfy your hunger without ruining your daily calorie goals. Tortilla chips meet this criteria if you limit the amount you eat to a 1-ounce serving. Check the nutrition facts label on the brand you buy because it states the number of chips in one serving. Depending on the size of the tortilla chip, you may only be able to eat eight chips to stay within a 1-ounce portion, which makes it easy to overindulge if you grab handfuls out of a family-sized bag. The amount of fat you'll get per serving ranges from 2 grams in low-fat varieties to 7 grams of total fat in regular varieties. A healthy snack should be low in fat, which means 3 grams or less in one serving, according to the U.S. Food and Drug Administration. In addition to keeping an eye on the total fat, check the nutrition facts label to be sure the brand you buy doesn't contain trans fats. These fats are worse for your health than saturated fats because they increase bad cholesterol, lower good cholesterol and trigger inflammation, according to the Harvard Health Publications. You can enjoy the salty flavor if you stick with plain tortilla chips. They have 88 milligrams of sodium in a 1-ounce serving. This amount easily works with your diet, as long as the total sodium in the rest of the foods you eat that day doesn't exceed the recommended daily intake of 1,500 milligrams. Flavored varieties are not healthy because they have more sodium. For example, the sodium in taco-flavored tortilla chips increases to 223 milligrams, according to the U.S. Department of Agriculture. If you choose unsalted varieties, the sodium drops to about 4 milligrams per serving. Yellow corn and white corn tortilla chips share about the same nutritional profile. While both types contain a small amount of nutrients, they have less than some other snacks. Blue corn tortilla chips make a better choice because they're slightly higher in protein and provide at least double the calcium, iron and niacin. If you make your own tortilla chips, you can reduce the calories and fat. A 1-ounce corn tortilla brushed with one-half teaspoon of canola oil and then baked contains just 82 calories and 3 grams of fat. Avoid high-fat dips and cheese sauces. Tomato salsa is low in fat and calories, yet rich in vitamins and minerals. Guacamole provides healthy unsaturated fats, but is high in calories. Columbia Health: Blue Corn Chips: Are They Healthier? How Many Calories Are in Fries?